As mentioned last week in my article about Was That The Market Top?, I continue to worry about further general market weakness. So far,Sell in May and Go Away has been the correct strategy. To protect myself, I made three trades today. First, I sold my shares in BBR.TO – Brett Resources Inc. I’m up over 122% on these shares this year, due largely to their imminent takeover by Osisko Mining Corp. I like Osisko, and I may buy some shares in it, but I don’t want the hassle of owning some fractional number of Osisko shares when the takeover happens. And, if there will be further market weakness, I like the idea of taking the profits and converting them to cash. So I did. $66.25 looks like a resistance level, and with RSI over 70, and with the share pricing increasing by about 18% in the last five weeks, a pullback of some sort seems likely. I like Agnico, and don’t want to sell it, but I want to protect against the downside, so I did a covered write. 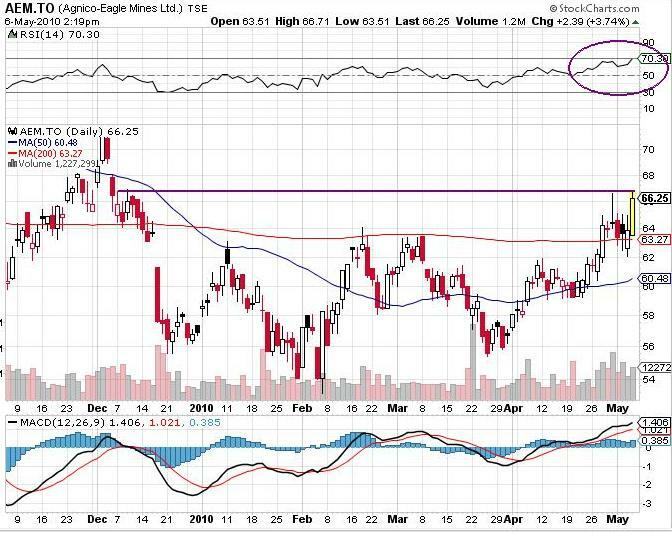 While Agnico-Eagle was trading today around $66.10, I sold the May 68 calls (that expire on May 22), for $1.30. If AEM is trading at less than $68 + $1.30, or $69.30 on May 22, I make money. That’s a further 5% increase from today’s levels, which is possible, but less likely after the run we’ve already had. I only covered about half of my shares; I still have upside, but also get some insurance. 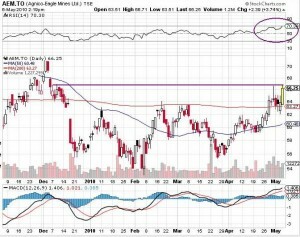 I did the same with G.TO – Goldcorp Inc. It was trading around $45.57, and I sold the May $46 calls for $1.10. That’s not as good as the deal I got on AEM, but again, protection is important. Finally, I put in a stink bid for more shares of CMK.TO – Cline Mining Corporation. I haven’t been filled, yet, but I still like the story (you can read the Cline Mining Story here), so we’ll see if I can add to my holdings. I’ll provide a further update on Saturday.